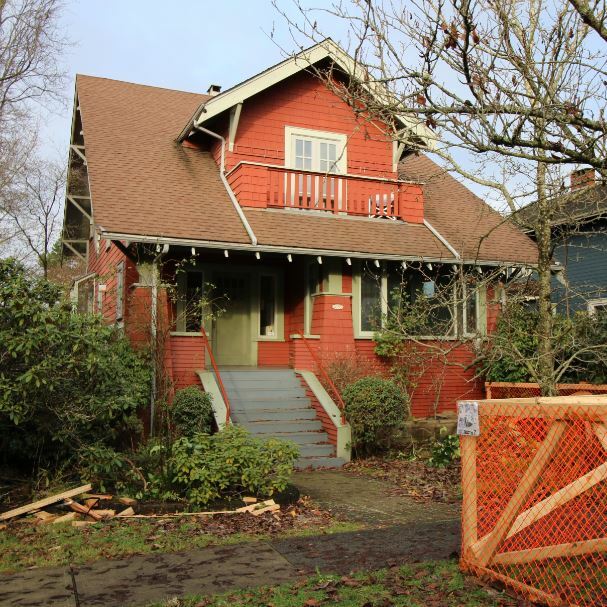 This heritage house was recently demolished that could have instead provided for more units and infill, argues planning activist and private project manager Elizabeth Murphy. Vancouver became renowned for participatory community planning based on the principles of Jane Jacobs. But over the last decade, this reputation has become undeserved. There has been a shift from a sustainable complex city of neighbourhoods for people to bland density obsession for the benefit of developers. Vancouver has lost its way. Jacobs’ influential writing was central to stopping major highway and urban renewal that was destroying inner-city neighbourhoods in the 1960s. She stopped the Lower Manhattan Expressway through her neighbourhood of Greenwich Village in New York City, the Spadina Expressway when she moved to Toronto and this also inspired the 1970s cancellation of Vancouver’s proposed highway through Grandview, Strathcona, Chinatown, Gastown and the waterfront. This set Vancouver on a new sustainable path based on Jacobs’ principles of neighbourhood-based participatory planning. Prior to 2007, the planning process in Vancouver included meaningful involvement from the people who lived here, such as CityPlan and earlier Local Area Planning. This was a basic principle that resulted in a sustainable mix of neighbourhoods that focused on social capital. However, the shift over the last decade from livability to growth, at both the regional and civic level, has resulted in housing primarily as a commodity that has caused a severe affordability crisis and increased homelessness. Globalization has only made this worse as over-development has been consumed by inflationary forces that locals cannot compete with. Yet those who live here are increasingly being excluded from the decision making process that is dominated by the development industry that benefits through their control of city council. Recent citywide rezonings are a case in point. Without community consultation, the outgoing Vision council is forcing through rezonings that affect the majority of the city right before an election when few are running for office again. Adriane Carr (Greens) and the NPA voted against the rezoning while Hector Bremner (of Yes Vancouver) voted with Vision for the rezoning. The reasons why this approach is failing Vancouver are many. In simple terms, it is because we are demolishing the older more affordable housing and replacing it with new, more expensive units that most locals cannot afford. So as rezoning increases outright supply, this cycle continues. To moderate the inflationary aspects on land values, there needs to be a lot of older buildings with only incremental development that evolves over time. This is the lesson from Jacobs that new ideas need old buildings since they tend to be the most affordable for both owners and renters. Too much new development, or land inflation due to increased development potential, kills social capital. This affects both housing and small businesses. Addressing this requires a deeper dive into the details of zoning. There are a number of residential zones that allow new development with provisions that moderate demolitions and have demonstrated they keep this balance in check. These are called RT zones that are in parts of Kitsilano, Mt. Pleasant and Strathcona. These use incentives to retain and adaptively reuse existing character buildings, with disincentives to demolish, while allowing new development where appropriate. These same principles can be used to create duplexes on a conditional basis rather than the outright duplexes that have just been approved citywide. The details of how a zone is crafted makes all the difference in terms of what the results would be. It was just this kind of RT zoning that was requested by the community for RS zones through the character house zoning review undertaken a few years ago. Even the new RT5 zoning would have sufficed. But rather than implement it, the demolitions of character houses have continued at about 1,000 per year. A terrible waste and loss to the community. Rather than the current outright rezoning for duplexes that will only be a further incentive for demolition, the city could have approved the RT-type of zone that would have still allowed duplexes, but in a much more sustainable and supported way. This has been a lost opportunity and a tragic mistake. The logic presented by the city is that if someone is going to demolish anyways, rather than building a new monster house, they can now build a new duplex. But the fact is that the introduction of strata is a big change for RS, that currently is the only rental zoning in the city. However, in an RT-type zone, there would be less demolition and instead more units through adaptive reuse. This has numerous advantages for the public interest. New development is then more incremental with less land inflation and more overall affordability. Character and heritage is retained, including mature gardens and neighbourhood character remains intact while providing more units and incentives when existing buildings are adaptively reused. More units are likely to be rental rather than strata. Less waste goes to the landfill when demolition is avoided. This is what density done right should look like. Not what we are getting. Under Sam Sullivan and then Vision, the city has moved toward the practices of Jacobs’ nemesis, New York City master-planner Robert Moses, who was demolishing neighbourhoods and forcing through highways and urban renewal towers. The subways in Vancouver are having a similar affect in demolishing entire 12-block-wide corridors for high density development. The Broadway subway is proposed to do something similar to the Cambie corridor, with high density from 16th Avenue to 4th Avenue, from Commercial Drive station to the University of B.C. This is not a done deal yet, but this is where things are headed without a change in direction. When deciding how to vote in the Oct. 20 civic election, look closely at how the current council has voted on the most recent citywide rezoning, as mentioned above, and vote accordingly. 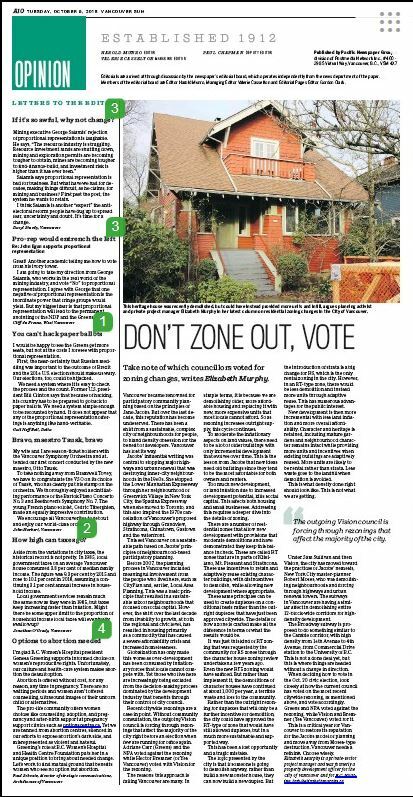 Greens and NPA voted against the rezoning, while Vision and Bremner (Yes Vancouver) voted for it. This is a critical year for Vancouver to restore its reputation for the Jacobs model of planning and move away from Moses-type destruction. Vancouver needs a rethink. Choose wisely.